Which City is the Most Tiki? An interesting discussion is taking place on Tiki Central. 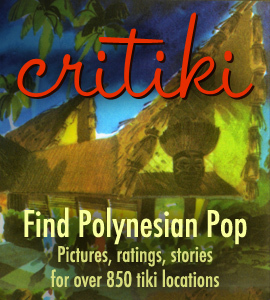 Christiki295 posed the question, “which city is the most tiki?”, prompting various folks to weigh in on the strengths of various Polynesian Pop hotspots, past & present. Generally, Los Angeles seems to be getting the most attention. All the cities that have been mentioned are worthy contenders, and have varying states of tikiness in their histories and present-day. Assuming that the use of the word “tiki” in the question relates semantically to what we’re all gathered here for (midcentury Polynesian Pop), rather than actual Oceanic art, my vote goes to the greater Los Angeles area. Sabu made reference to the sheer amount of tiki here, using apartment buildings as an example, and that hints at what I think makes Los Angeles special: it seems that here more than anywhere else Polynesian Pop was embraced in an everyday fashion. In other parts of the country, tiki bars and Polynesian restaurants were popular and active, but here, tiki life was actually happening. Here in southern California, beachcomber living and suburban savagery was in people’s homes and people’s livelihoods, sometimes cheekily, sometimes seriously. Additionally, the idea of casual tropical exoticism equalling glamour was really solidified by the earlier Hollywood pre-tiki establishments, like Sugie’s Tropics, Bob Brooks’ Seven Seas, and Don the Beachcomber. Chicago is definitely a contender on that front as well. Midcentury Polynesian Pop has many roots in all sorts of places, but for me the most meaningful roots are here in Los Angeles. Aside from that, I almost want to consider the Mai Kai as a city unto itself. The Mai Kai is the single best tie we have today to the heyday of Polynesian Pop.